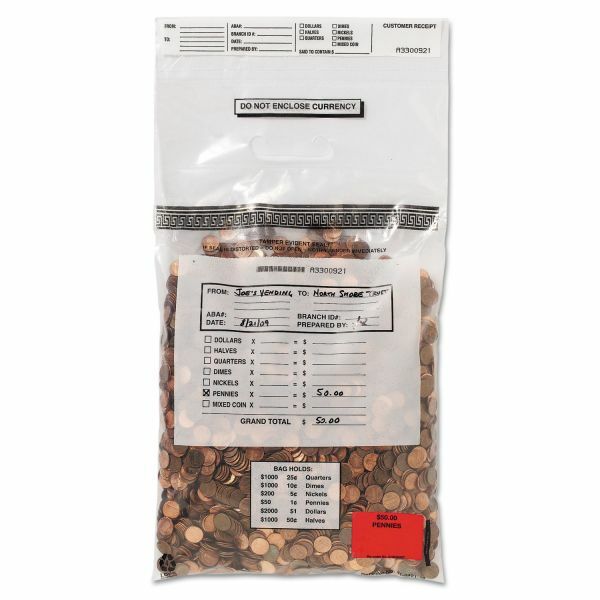 MMF Industries Tamper-Evident Coin Tote, 50lb Cap, 6.5mil, 13 x 22, Clear, 100 Bags/Box - Ideal for banks and retail stores, the MMF Industries™ Single-Handle Self-Sealing Coin Deposit Bags meet Federal Reserve Standards. The tamper-resistant, pressure-sensitive closure seals safely and securely. Made of a non-slip textured film with heat-sealing seams, the film is specially blended to reduce tearing and provide stretch-- holding up to 50 lbs. of coins. 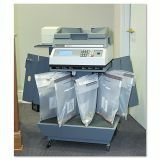 The bag features a write-on surface to record contents; the alphanumeric barcode and tear-off receipt provide internal tracking. The bag's low slip texture makes the bag ideal for stacking. Air vents on the bag are included to release trapped air and moisture when the bag is sealed. The single handle offers easy transport. 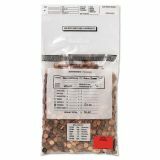 An ABA color-coded shipping label can be purchased separately to adhere to the top left corner of bag to color code and route shipment.